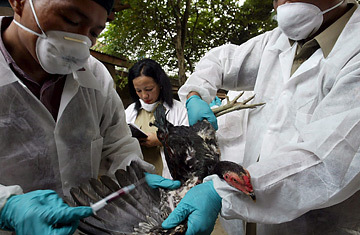 An Indonesian health officer takes a blood sample from a chicken during a birdflu investigation in Jakarta. Officials in Indonesia said they were angry that viruses from their country might be used to make a commercial bird flu vaccine that they themselves would never be able to afford. They had a point; poor developing nations are often priced out of needed medicines, and they're likely to be the last in line for vaccine during a pandemic. Desperate to get the supply of samples flowing once more, WHO officials came to Jakarta in late March to broker a deal, assuring Indonesia that their samples would not be given to drug companies without the government's permission. Indonesia seemed to agree to resume sharing, but a month and a half later, the WHO says it still has yet to receive any virus samples from Jakarta. Now Indonesia Health Minister Siti Fadilah Supari tells TIME that there's been a lack of "goodwill" from the WHO, and that Indonesia won't share a single virus with the international community until it receives a "green light" from the WHO that Jakarta would retain commercial control of its samples. "We feel let down by the WHO," she said in an interview last Friday. "We only demand fairness." But when pressed on exactly what Indonesia what it will take to get that "green light," Supari is less than specific. She says she doesn't necessarily need an agreement in "black and white" recognizing Indonesia's ownership rights, yet goes on to argue that Jakarta should have final say on any vaccines made from its viruses. For its part, the WHO has tried hard to accommodate Indonesia's objections. At a high-level meeting in Geneva late last month, the WHO raised the possibility of creating a virtual vaccine stockpile that developing countries might be able to draw upon in the event of a pandemic. But there's plainly frustration that Indonesia remains stubborn. "We're grateful to [Supari] for helping us understand the concerns of developing countries," says David Heymann, the WHO's senior representative on pandemic influenza. "We'll be even more pleased if we see them begin to fully share their virus." The dispute has centered on future flu vaccines that might be used from Indonesian viruses, but in reality that question could be moot. If H5N1 in Indonesia were to mutate significantly tomorrow and begin passing easily from human to human, triggering a pandemic, the virus would spread around the world rapidly. Scientists would begin working on a vaccine based on the pandemic virus, but it currently takes about six months to produce a new flu vaccine. (By contrast, the most recent influenza pandemics in 1968 and 1957 crossed the globe in about four months  and that was before widespread jet travel.) The global manufacturing capacity for flu vaccine is around 500 million doses. That means that a new pandemic could well run its course and kill millions before anyone could get their hands on a new vaccine. Everyone  rich and poor  would be left out. At best, a previously stockpiled vaccine made from the current strain of H5N1 could provide some partial immunity, but there will be no way of knowing until the pandemic hits. That doesn't mean the fight is meaningless. International experts need to have samples in lab to fully analyze the behavior and genetic structure of the bird flu virus, looking for the all-important mutation that might mean H5N1 is ready to go pandemic. (Currently H5N1 only rarely infects human beings, but flu viruses change constantly  hence the need for up-to-date analysis.) Since Indonesia is where most new human bird flu cases have been occurring  as one Jakarta official acknowledged with a twist of pride, "We do have the most deadly virus"  scientists need to see Indonesian samples. That can help them pinpoint exactly when a pandemic might be in its beginning stages, still early enough to be controlled with a rapid response. Indonesia may be right to criticize unfair access to vaccines, but by withholding their samples, they're hobbling global pandemic surveillance. "That puts the rest of the world  and Indonesia  at a greater security risk," says Heymann. Both sides expect the problem to be addressed at the World Health Assembly, the annual meeting of all 193 member nations of the WHO, which begins May 14. Indonesia has been weathering criticism of its response to bird flu since the outbreaks began, but the country will come under intense international pressure if it continues to abstain from sharing. One international health expert based in the region notes that Jakarta hasn't been shy about asking for international help in controlling the disease in chickens, claiming that bird flu had originated outside its borders. "But when it comes to sharing samples, they take the position that the virus belongs to them," the expert said. "It's somewhat contradictory." Despite its recent refusal to share samples, Indonesia has actually been fairly open about bird flu and prompt in reporting new cases  considerably more so than China, which remains a "black hole of bird flu data," according to the expert. But that goodwill will be squandered unless Indonesia resumes sharing. Unfortunately, Jakarta may be digging in its heels. Supari told TIME that "the current unfair access to vaccines worsens the global inequality between the rich and the poor, between the North and the South  and I think that is more dangerous than a pandemic." Unless Jakarta changes its policy, we might all get the chance to test out Supari's theory.